New World Empires is a browser based free to play strategy where players control their own realm at the start of the 19th Century, a time of conflict and opportunity as the new world is being discovered and every nation is looking to carve out their own slice of this new land and colonize it for themselves. In the game players control one such nation and must manage their own provinces and lands, recruit an army, manage their resources, make trade and diplomatic negotiations, and ultimately battle it out with their rivals in PVP. The game can be access directly through your web browser and does not require a client download. New World Empires is a tactical strategy MMO where players control individual nations set in 19th Century Europe where the world is broken up into a vast amount of historically accurate territories. Players must gather up resources, train a powerful army and take control of these territories to advance their Empire and ultimately win the game. The game has an extremely slow pace where researching tech, constructing buildings, training units and even moving them around the map can take hours or days; players are able to log out of the game whilst their nation continues building, training and moving around as decided and then can log back in the game later to continue playing when these tasks are complete. Whilst players are able to form alliances, engage in trade and diplomacy and otherwise work cooperatively, the game is geared towards competitive play and particularly towards the mid game revolves a lot more around PVP with other player’s nations. When first joining the game players can either be randomly assigned a country, from dozens of historical nations, or select one that they would prefer; they fill the roles of the various active nations which are otherwise controlled by AI until more new players join that particular world. Starting with a handful of towns or cities the player gains an income of resources from these locations as well as a few units to help defend them against the AI and their rival players. Players must focus on advancing their nation by researching new technologies, broken down into various categories such as economy, warfare and colonizing, the technologies a player researches will define their playstyle and path to victory. To stop players advancing too quickly down the research trees, or using premium currency to buy their way to more powerful late game technologies, the techs are separated into different tiers that are unlocked at different stages as the game goes on giving a set number of days before the next tier is available. With new technologies unlocked players will construct buildings to enhance resource production, keep their populous happy with their Morale up (low city morale leads to bad production and possibly a revolt), or training up various units. Players can look to expand to new undiscovered territories and create both explorers and colonists to settle them, allowing expansion without aggressions, alternatively players can form an army to take what they want. Armies are formed of various types of units, from infantry to artillery to naval vessels, and are stationed in player’s towns and cities as defenders or used as rally points to begin an assault from. 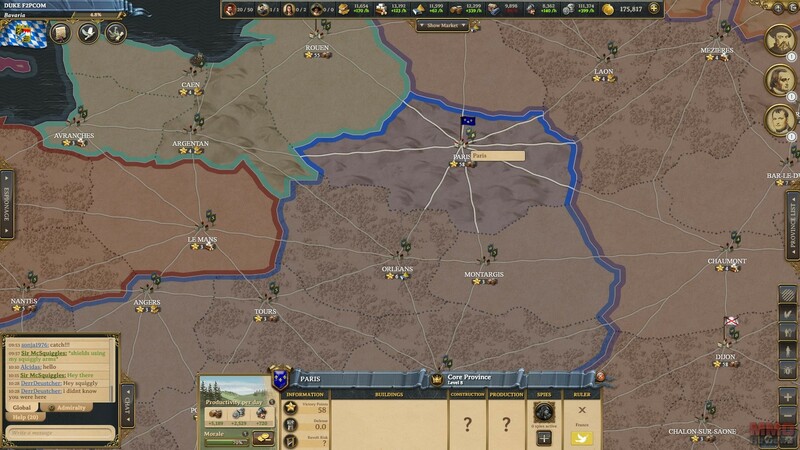 If a player wishes to declare war on a rival nation then they can march their units into their land and attack their settlements to conquer and control them. Each world’s game runs for around 60 days, each province that a player controls is worth a certain number of Victory Points (capitals of a country are worth more), at the end of the 60 days the player with the most Victory Points is declared the winner of the game and then players are free to join a new one.